Up til now I've had multiple threads for builds etc, etc. But with everything going on at the mo, I'm going to roll everything into one terrible place for you all to frown and laugh at. 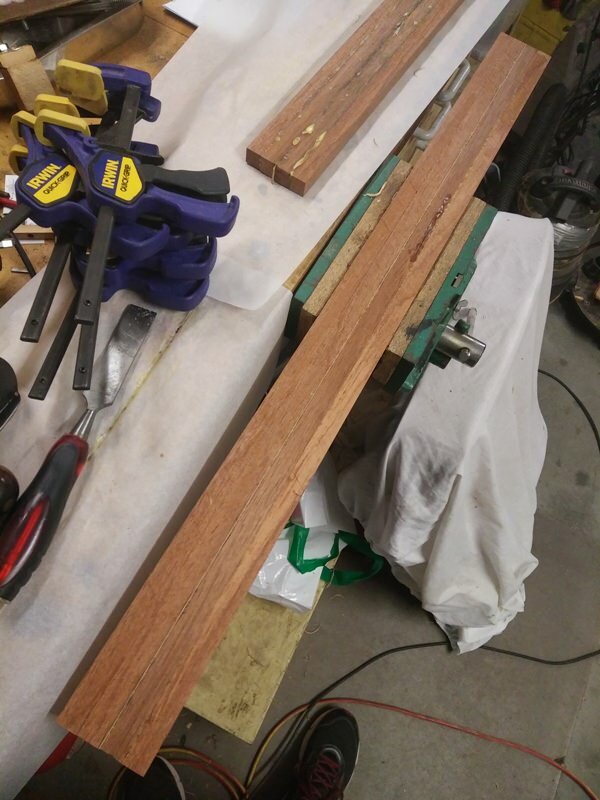 I've got too much wood, too many ideas, too many broken guitars and not enough time to do everything (and a car project) so we'll chip away at things a little at a time. Having said all that, I'm a firm believer in throwing more wood on the fire. 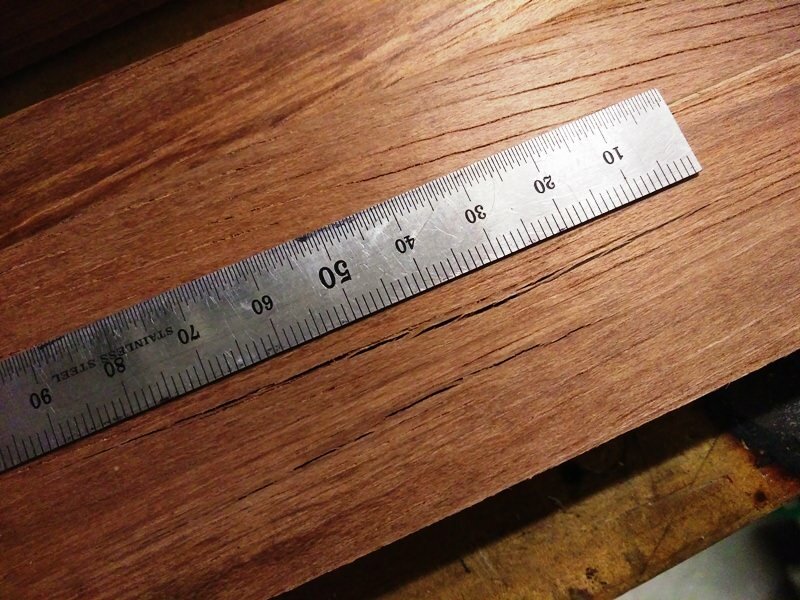 So on a trip to Bunnings yesterday I bought a 1.8m piece of Meranti. 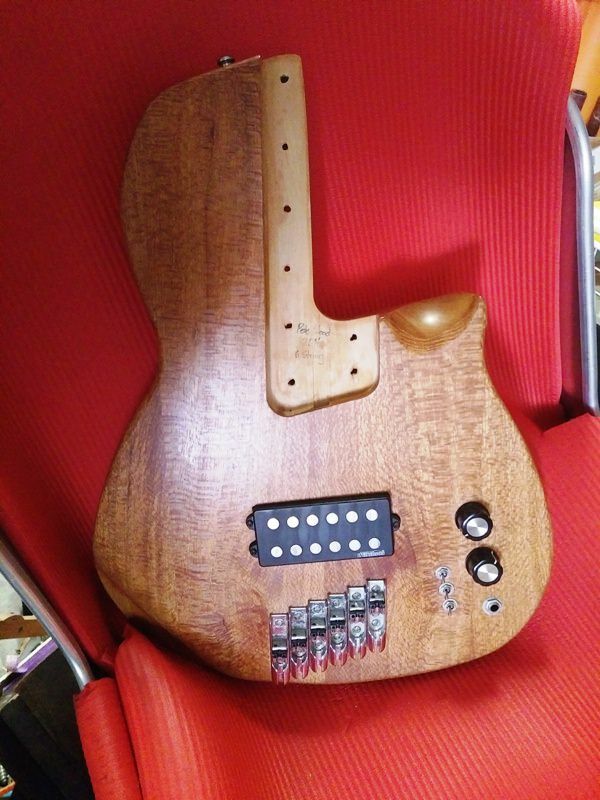 My luthiery mentor told me some time ago it's a lot like mahogany and I've always wanted to build a mahogany neck bass. I had to go through the pile to find a nice straight bit. This was the heaviest, straightest piece so I brought it home and ripped it into quarters. 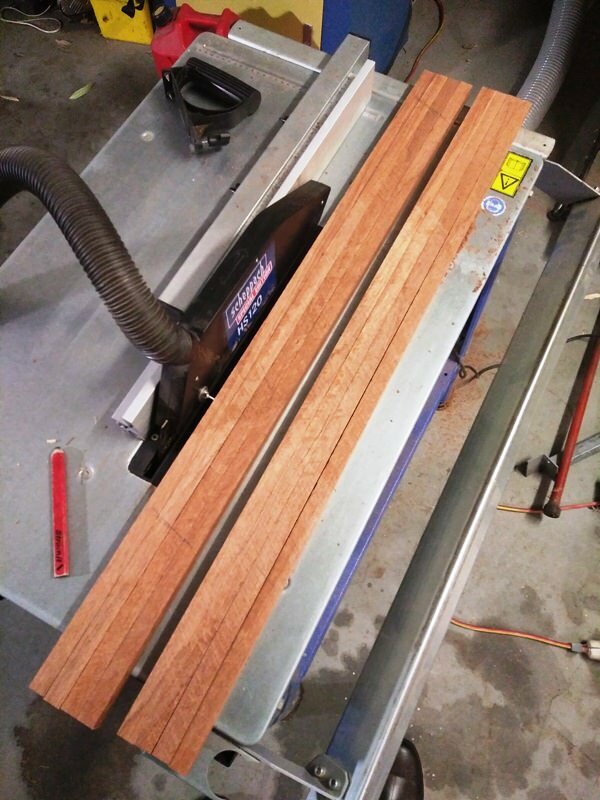 I learned something important (and embarrassing) about my table saw, but no one got hurt and the wood was ready for glue up. 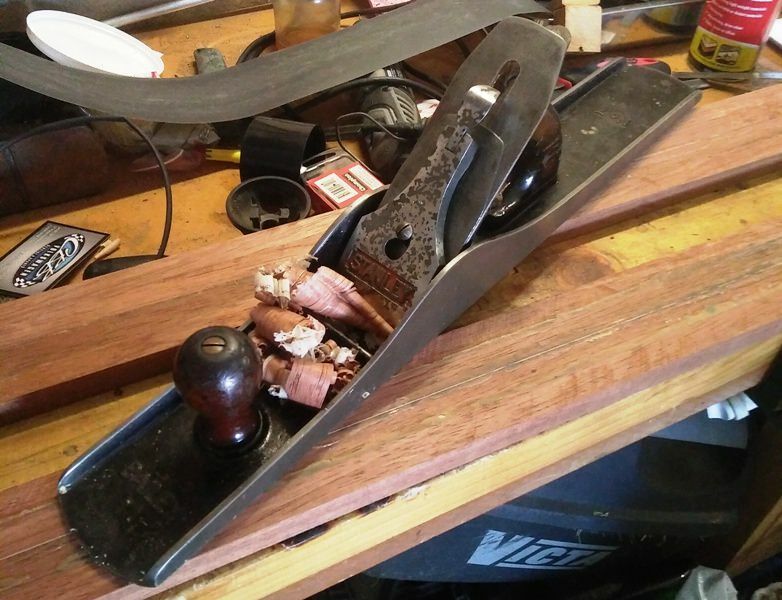 Old No.7 Stanley plane! Monster of thing. Love it. Then they'll get thickness to 18mm (or whatever my disasters leave behind). In other news I'm fixing this thing on the left. Epiphone Dot. 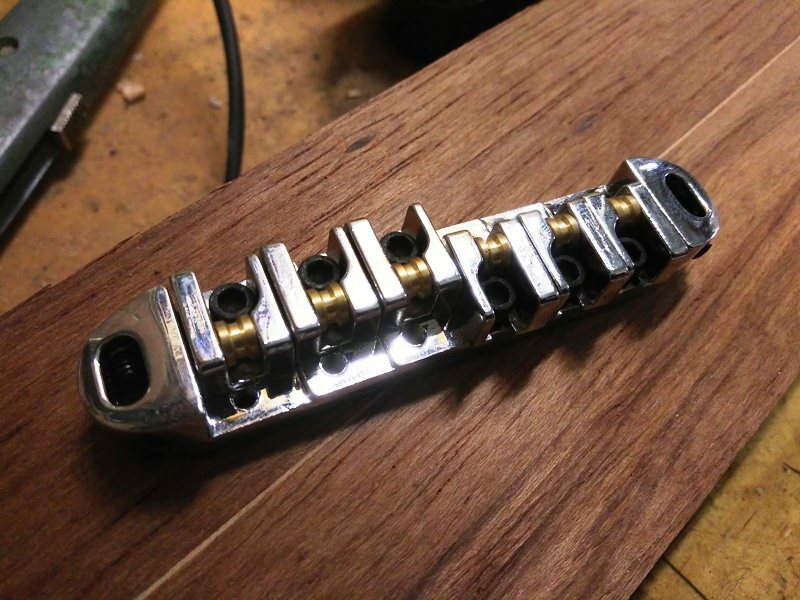 The original plan was to graft the headstock from the cream guitar on, but I've changed my mind. 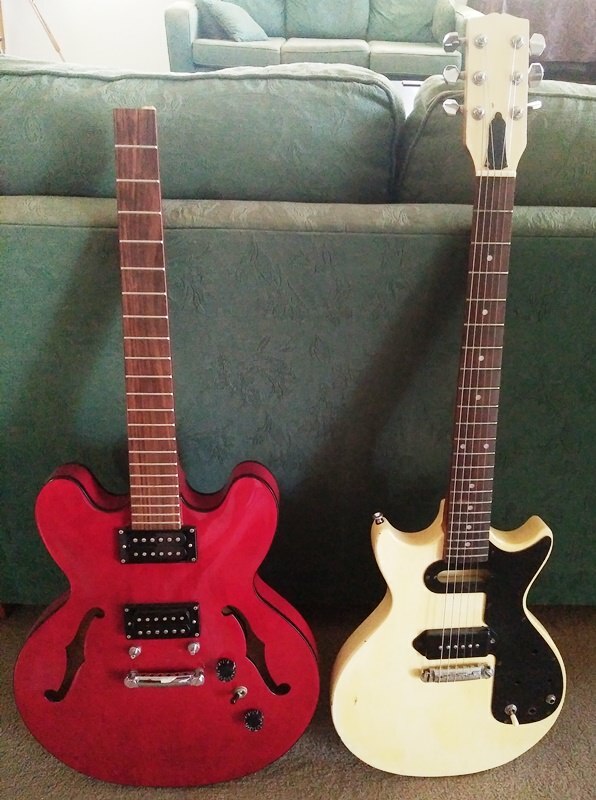 After a buying a headless travel guitar on my US trip, the 335 will go headless too. I'm just waiting on the tuners from Aliexpress. Hence my requests. Should be a sweet little repair for a different guitar. I've got the rest of the hardware here or on the way. I just need to make a locking nut. I already have the aluminium. P.s. sorry for all the unintended puns. This is the guitar I bought in the states... and yes the headless thing works well. Nothing to snap off if it falls over. $20 for two neck blanks. I, too, have many things on the go (another one to be revealed soon) but thought splitting them up makes it easier to follow. Anyway, following with interest, Pete, and good to see you back "reporting" after your longish absence. Man, this thing is AWESOME. 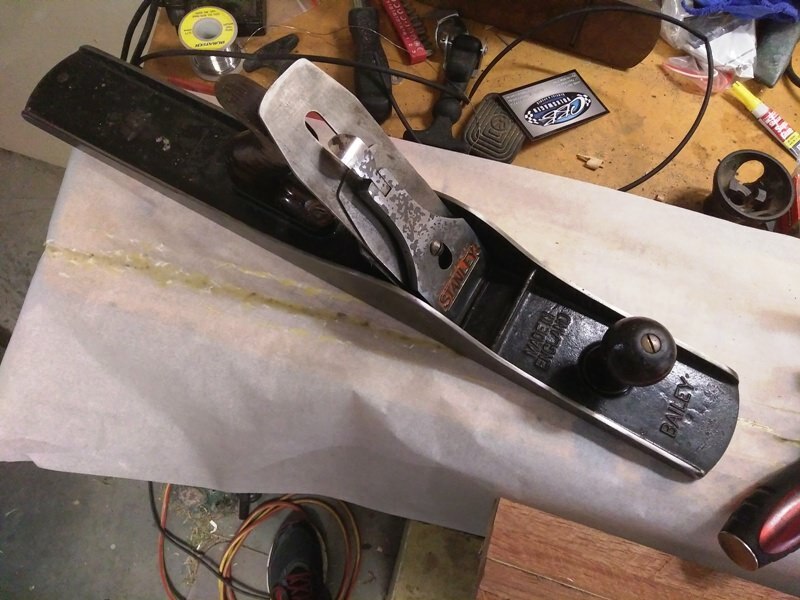 Had to sharpen some missing chunks out of the blade, but then. Oh the ribbons of glory! This evening I was able to fire up the thicknesser and dust extractor for a few minutes to run these through. I'm pretty happy with them I have to say. Wetted down the grain looks pretty good and the pinstripe of Tassie oak really highlights the combo. One came out at 17mm and the other 18mm. So I guess I have a slim neck and thick neck depending on what I want to use them for. The only downer was this split. It goes all the way through the timber to the other side of the blank, which I'd already started filling with superglue anyway. I started wicking glue into it just after I took this pic. 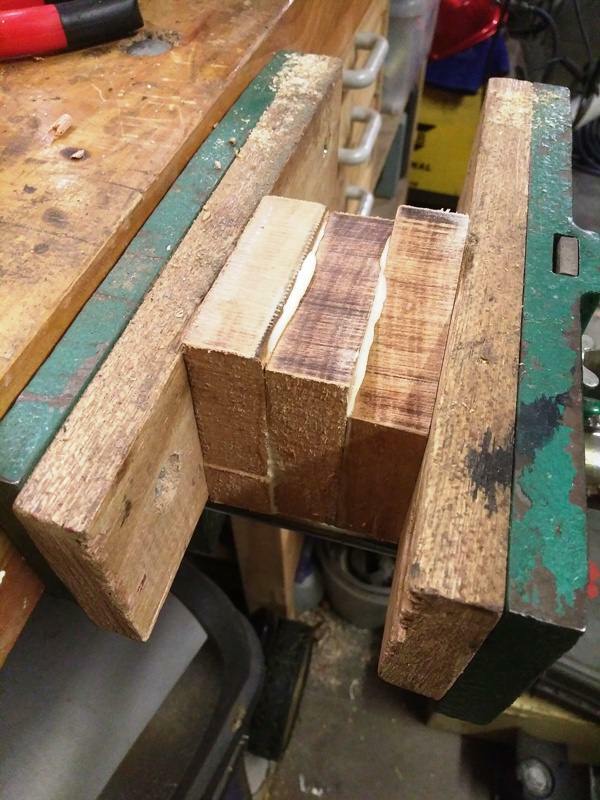 It's on the thicker of the two blanks, so now it's filled it should be fine. 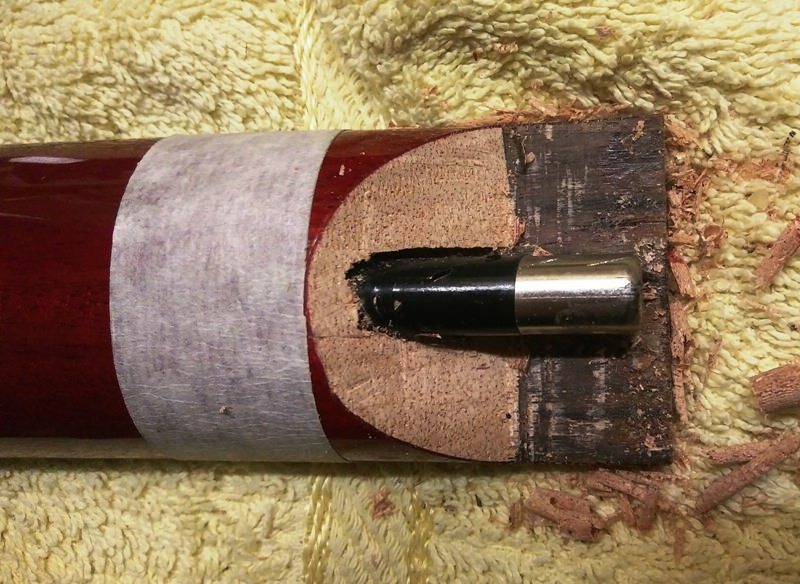 Superglue is stronger than the timber anyway and with a multi-laminate like this, there's little risk of it moving around. I'll put both blanks away now and let them settle for a while before I use them. 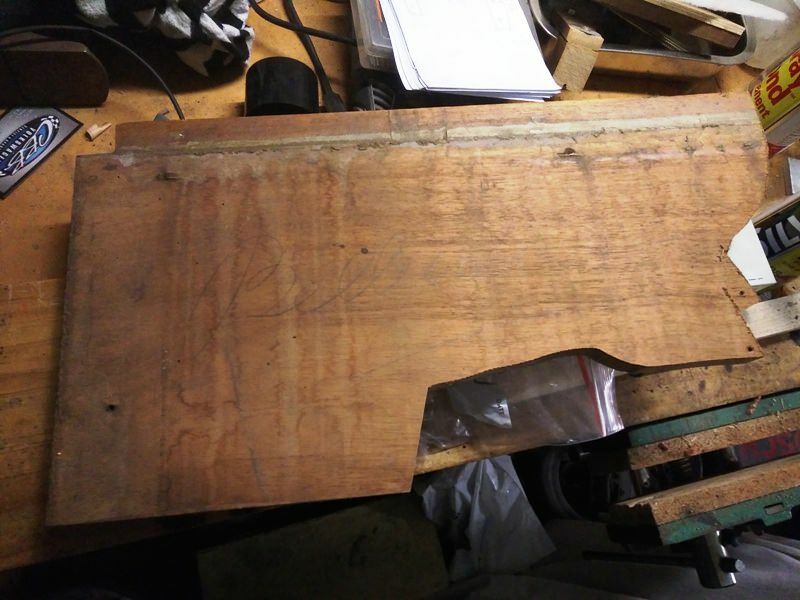 I briefly looked at a piece of Tassie oak I have in the corner tonight and thought, "I should make some blanks with that". So that might happen in the near future... or not. In other news, this turned up today for the broken 335. Not bad for $10. 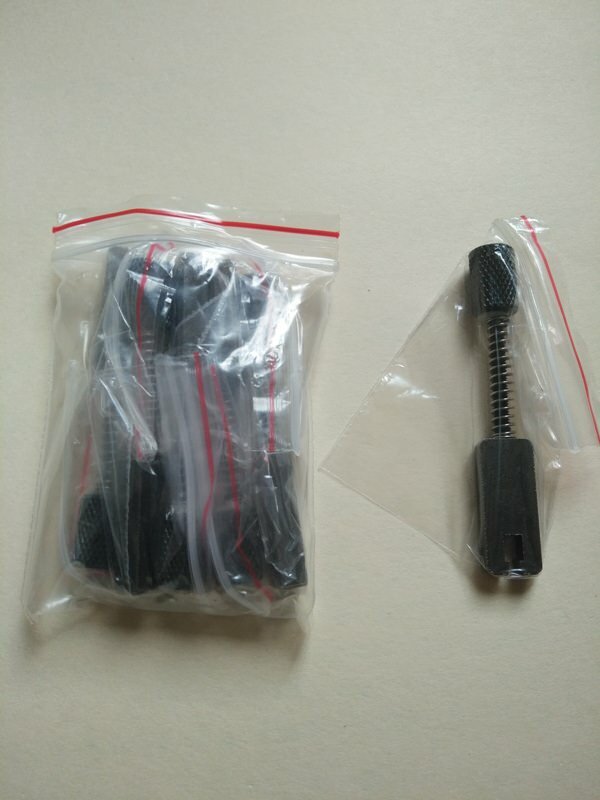 This headless string tuners turned up today. I'm pretty happy with them. I'll have to come up with a tailpiece to go with them. Shouldn't be too hard. 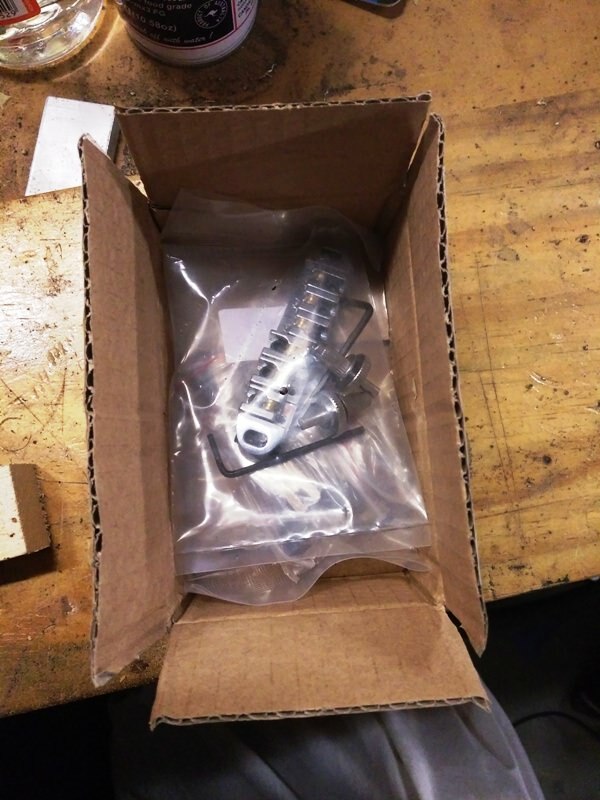 One of the kids said, "all you spend money on is guitar parts!" Me; "No, that's not true." Kid; "Well what else do you spend money on?!" Not so many smarty-pants accusations with that realization. 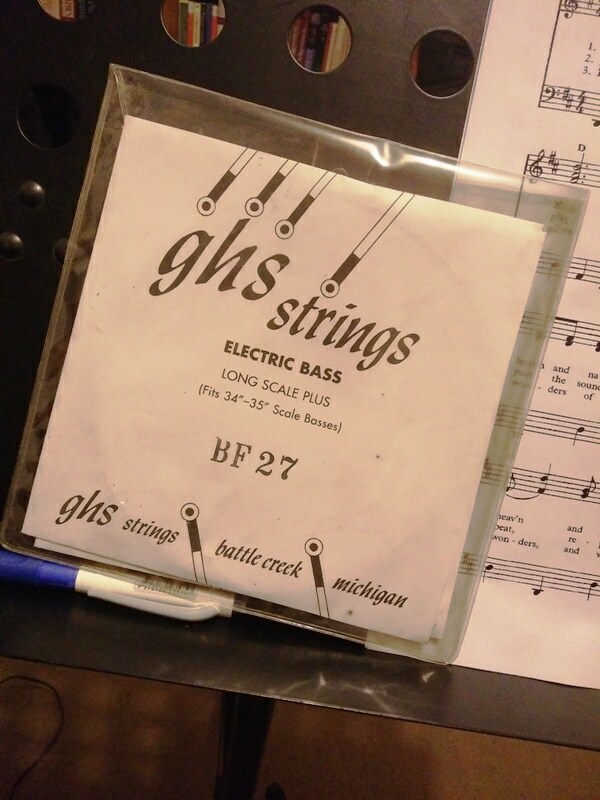 Brite flat 27s (C strings). I've got some others so I might try and put together a set and build for them. Fretted. Highly chambered. Not sure what else yet. Maybe a spruce top from the piano I pulled apart. I now have all the parts needed to put this back together. I've been trying to figure out what to use on the end of the broken neck. I went through my wood pile and I have hardwood or Kauri pine. And nothing in between really. So, I've chosen this offcut from the last 6 string I built. It's got some writing on it from the guys who made the table it came from. It's super solid, so it should hold screws well for the headless setup. That's my biggest concern. 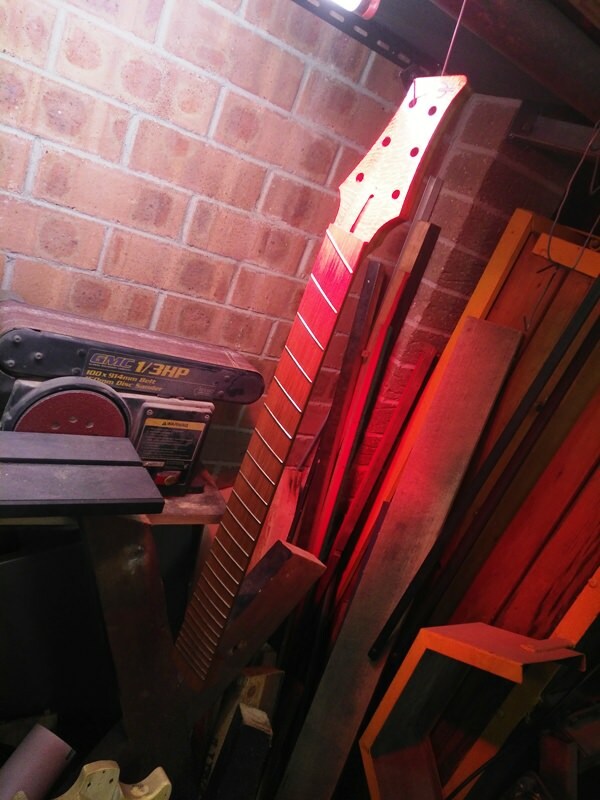 I've got the fanned fret 6 string on the bench today. I made the mistake of using furniture wax on it a few years back and I HATE the tacky, grippy feel on the neck. So I'm cleaning that off and hoping to refinish it with wipe on poly. As much as I love tru-oil style finish on the neck, I find they get grubby and sticky. The wipe on poly on the other hand is much better and never gets gunky. The 39" three planks fretless 6 string got some action last night at jazz club. I think I'm finally happy with the tone after feeling very disappointed with it. Wouldn't you know it, it was all down to pickup height. I wound them close to the strings and got a HEAP more bottom end and a lot less noise (relatively). I also found out the noise issue I was having with the neck PU was down to electronics pulses from the powerboard, that's right behind my office wall. So while I'll need to come up with a sneaky way of shielding the PUs better, in the majority of places, that silly noise won't be an issue. BTW, does anyone know if paint thinners softens titebond? I'd like to use it to wipe the wax off complete. Considering it is a water-based glue, and thinning (by up to 5%) is possible with water (NO organic solvents mentioned as thinners) I would reasonably confidently say that no softening will occur. Might be worth doing a test though before using it on a neck. 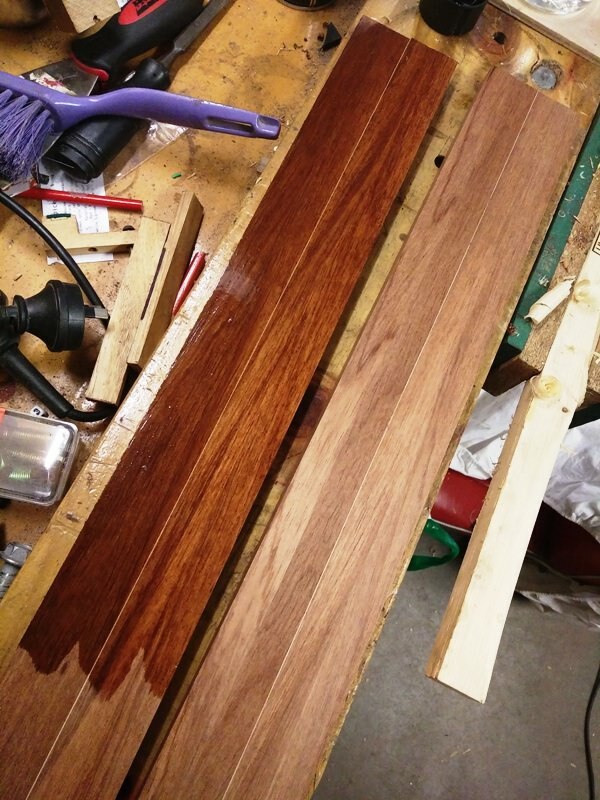 Put the second coat of wipe on poly on the fanned fret neck. Overall, it's looking better than I expected. I've wondered for a while if it would be more flexible with a neck PU. 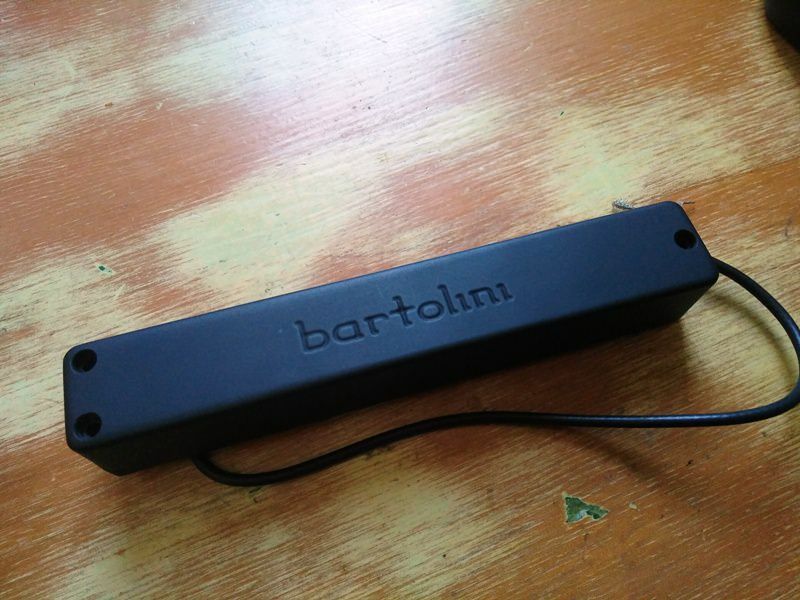 I've got these Barts (G66CBJD) I was going to using on a 6 string. I'm not going to build another 6 string now, so I'm thinking this might be a good candidate for this bass. I'd just change the kill-switch config around to include a second PU instead of different coils. What do you all think? Ok, so just put the Bart next to the MM PU. Totally out of size from one PU to the other. If I do put in another PU, I'll have to find something else. I laminated the wood into a 3 piece block. In retrospect I might not have need to do this, but it will aid the strength of thing. I've now cut my blank and marked out the trussrod slot along with the back angle on the blank. I'd fire up the router table, but my concentration span is not at it's best at the moment. Here it is all mocked up and yes it'll be trimmed down a lot shorter. The piece of aluminium (note the extra "i") will become a secondary locking head piece. I'm probably going to do this based on the Traveler Ag105 guitar I have that is headless. The double locking system prevents slipping, which is a thing. I've experienced it on the Traveler, so making up the headpiece for this really isn't too hard and is probably worth the trouble. 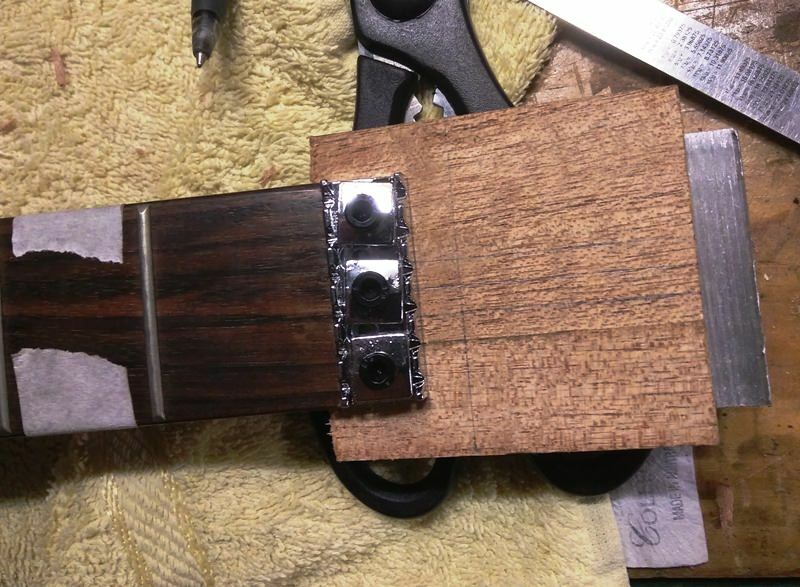 You might be thinking, "you could just graft that new headstock on and be done already... and you might be right. But where would the fun be in all that? No, don't answer.